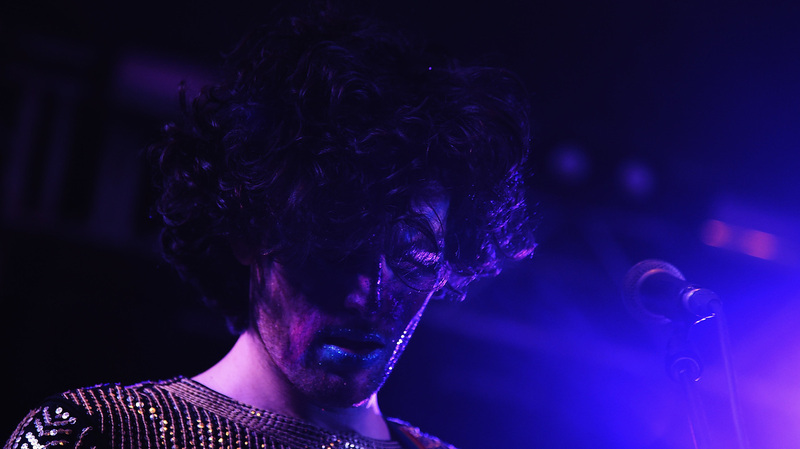 After Fallout, PWR BTTM Seeks Control Of Its Music : The Record After allegations of sexual assault by one of its members emerged last month, the band was quickly dropped from its current label, and its two albums were pulled from streaming services. Ben Hopkins of PWR BTTM performs at the NPR Music showcase during SXSW on March 15, 2017 in Austin, Texas. Last month, PWR BTTM's Ben Hopkins was accused of sexual assault. Following widespread reporting of those allegations, the two-piece band, whose other member is Liv Bruce, was dropped from its record labels, Father/Daughter and Polyvinyl. Today, the group is publicly detailing its efforts to gain control of its music. The allegations came in the days leading up to the release of PWR BTTM's second album, and resulted in a quick reversal of fortune for a band that been the subject of a New York Times profile and numerous features, including here at NPR Music. That rapid fallout resulted in public criticism levied by numerous artists who had been scheduled to open for the group on its tour, and who decided to cancel their appearances — and ultimately, the tour was cancelled altogether. PWR BTTM's former record labels, Father/Daughter and Polyvinyl, also ceased selling its music and removed the band's recordings from streaming services. Polyvinyl, the label to which PWR BTTM was signed at the time the allegations came to light, subsequently dropped the band from its roster and did not release the album Pageant, which had been originally scheduled for release on May 12. In its newest statement, which was released this morning, the band appears to be going on the offensive, saying that it still contested the claims against Hopkins and that "the band's 36-city tour remained canceled and their music remained unavailable on virtually every digital platform." PWR BTTM goes on to say that it has found a new manager, Lisa Barbaris, the head of So What Management. In today's statement, Barbaris is described as being "appalled" at the band's treatment by its former record labels. PWR BTTM has also hired a lawyer, Jeffrey Koenig, to help it wrest control of Pageant, the album that had been recorded for Polyvinyl. "Polyvinyl has not presented any viable plan to the band to make the music on Pageant available to their fans," the statement claims. Reached for a comment, a representative for Polyvinyl says the label "has been in contact with PWR BTTM's team to work out a separation, and is waiting for details necessary to make that happen. Polyvinyl wishes to make the transition as easy as possible and has no desire to prevent the band from releasing Pageant once an agreement has been reached. Beyond that, they're not at liberty to discuss the case as it's an ongoing conversation." A representative for the band confirms to NPR that PWR BTTM now controls its first record, Ugly Cherries, which has returned to digital streaming services.